Facing an opponent in wartime, in a life or death situation, would be terrifying enough; imagine how much worse it would be if your enemy were nearly ten feet tall and was over four hundred pounds of muscle? So it was for David as he faced Goliath, the most famous giant in the bible… but not the only one. A great bible story? Perhaps, but the images floating around the internet suggest otherwise. Were giants real, or just a very old myth that has recently become urban legend? Archeology often brings us new revelations about the past, one of the best (and only) ways to decode what has come before when written records fail. Digging up bones and examining them in exhaustive detail has given mankind evidence of dinosaurs, Cro-Magnon man, migratory patterns of ancient humans and a glimpse into how they lived and loved. Has it also brought us evidence of a race of giants? Not just giant human remains but also giant sized animals have been discovered according to the many reports that wind up in email inboxes and on various websites. One of the problems with the internet, however, is that a semblance of authority can be made quite easily with a polished website and cleverly written copy. Add photographic "proof" that can be manufactured in a few moments with Photoshop and other graphic manipulation software and it is no wonder people are talking about giants these days the same way they talk about the T-Rex. In 2005 the giant craze kicked off. Not only were websites popping up that were supposedly the journals of archeologists on the cusp of incredible discover, but actual videos were being posted online that showed the proof of their finds. To simply sit down and watch these videos provided a fairly convincing experience that one was watching a new era dawn in archeology, one that might challenge the existing order. Which was exactly what the creators of the video game Shadow of the Colossus wanted people to think. The websites and videos - each of which was created with enough difference in style to give the impression that they were all independent of each other - were part of a viral marketing campaign to build awareness for the PlayStation 2 video game that pit the hero against a succession of truly giant opponents (in some cases riding a horse up the body of a striding giant to do battle with it). Giants are certainly mentioned in the bible, although much is literally open to interpretation when it comes to the literal meaning of the word giants; many different words are used and in many different ways. Did it mean humans that were ten and fifteen feet tall? Or simply mighty warriors; tall and broad, surely, but giant? 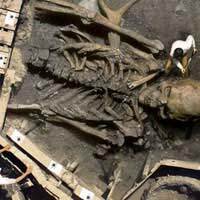 The bible is not the only source of stories of tree-sized humans, but as for all the video and photographic evidence on the web, they are all part and parcel of the giant bones urban legend.